This set from US Divers offers everything you need for a day of snorkeling. A high quality silicone mask, premium snorkel and proflex split blade fins keep you seeing clearly and moving easily while investigating the underwater world. Assorted colors, for specific color selection please call out customer severice at 1-800-800-5083. 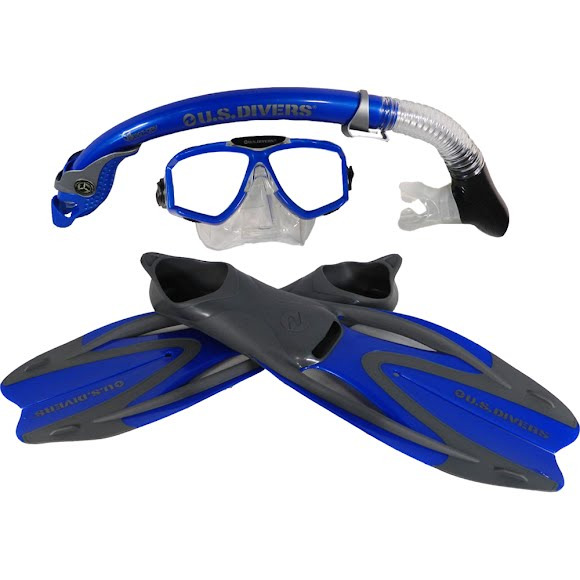 This set from US Divers offers everything you need for a day of snorkeling. A high quality silicone mask, premium snorkel and proflex split blade fins keep you seeing clearly and moving easily while investigating the underwater world. Assorted colors, for specific color selection please call out customer severice at 1-800-800-5083. An advanced tube-within-tube snorkel design keeps splashed surface water out providing unobstructed airflow and easy purge capabilities.